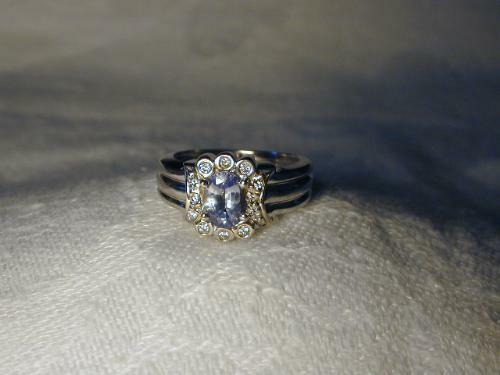 14K white gold ring with tanzanite and diamonds. There are 12 brilliant round diamonds and natural tanzanite, which measures 7 mm by 5 mm. The top of the ring measures almost 1/2 an inch long by 1/2 an inch wide. It is a size 6.5. Sizing is available. This ring weighs 7 grams. We accept payment from a confirmed account. Sales Tax: New York State Residents pay New York Sales tax. US Domestic Shipping: Shipping and insurance within the United States is Free. International (excluding US territories outside of the 50 states) shipping and insurance is $59.95. Your satisfaction is important to us! Please contact us to arrange the return of any item. Prior authorization from us is necessary for processing your return. Items to be exchanged for other items must be returned to us before new items can be sent out. Merchandise in resalable condition may be subject to a 15% re-stocking fee. GGEMS is proud to present the most exquisite antique and estate jewelry on ebay. We are bringing our customers a wide selection of gold jewelry including pieces from estates, close-outs, auctions and liquidations from all over the world. Our specialty is bringing you unique and high quality jewelry at unbeatable prices. Thank you for shopping with us! We appreciate your business.